I drink a lot of tea. That's not strictly a Christmas thing, it's just a life thing. But I definitely drink more at Christmas because it's a nice, cosy thing to do, especially if said tea is filled with cinnamon and vanilla, cloves and nutmeg, and any other festive spices that want to join the party. At this time of year, I will often buy a cheeky Christmas blend or two, and in fact this year, I treated myself to a tea advent calendar with a new blend or tea-based treat revealed each day. 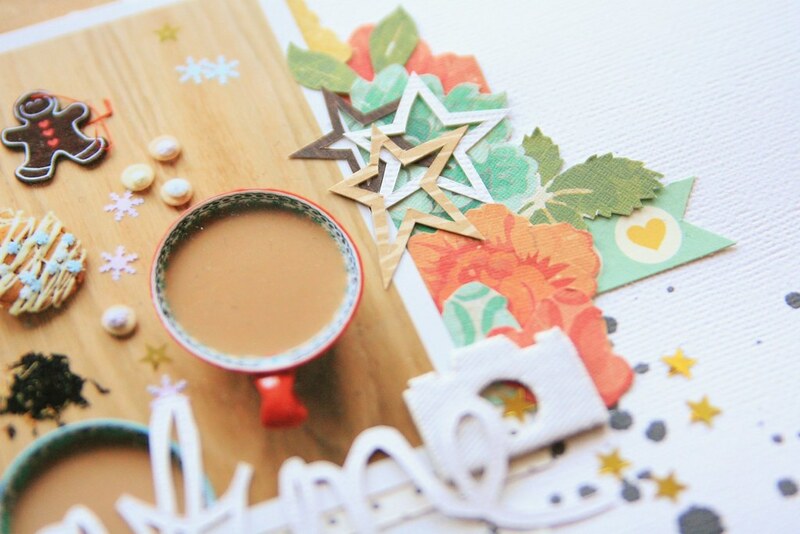 Last year, as part of my Journal Your Christmas, I took a few photos of my festive fascination, arranging the tea things into pretty layouts. You can find that post here. This year, I scrapbooked those pictures, to document my addiction. Hurrah for tea! 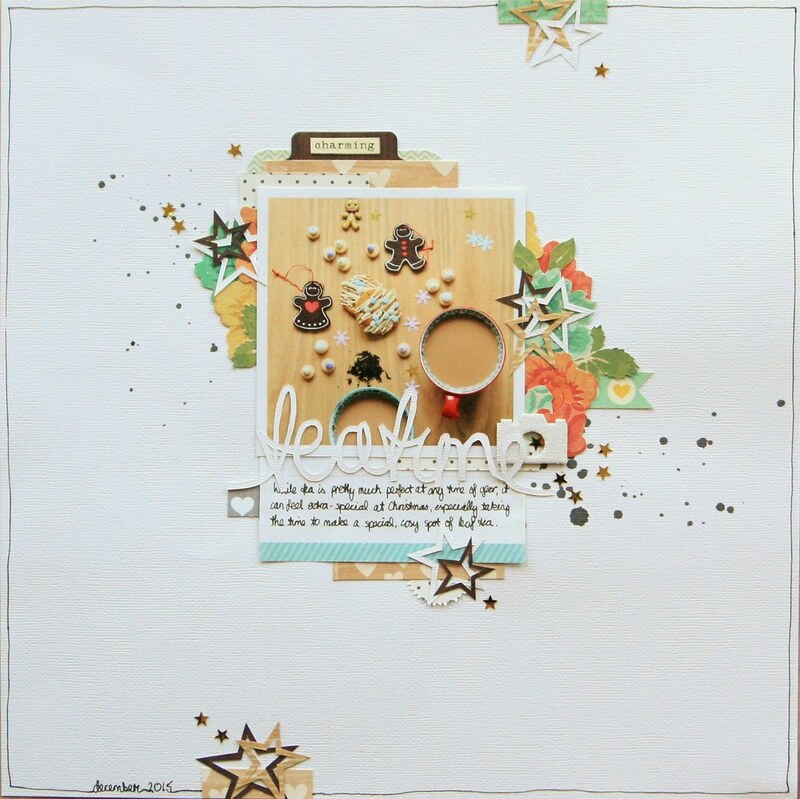 More and more when I scrapbook, I find I am using a white cardstock background, simply because I think it goes with everything, and it helps to define all the little details that go on top. I hate it when those details get lost, especially if I've invested a great deal of time creating them. I then chose a picture to represent the ongoing tea fascination, and layered up different patterned papers to frame it. I included some lined paper underneath the photo so that I could include a couple of lines of journaling. To embellish this layout, I wanted to add some detail and so I hand-cut flower motifs from a sheet of patterned paper. 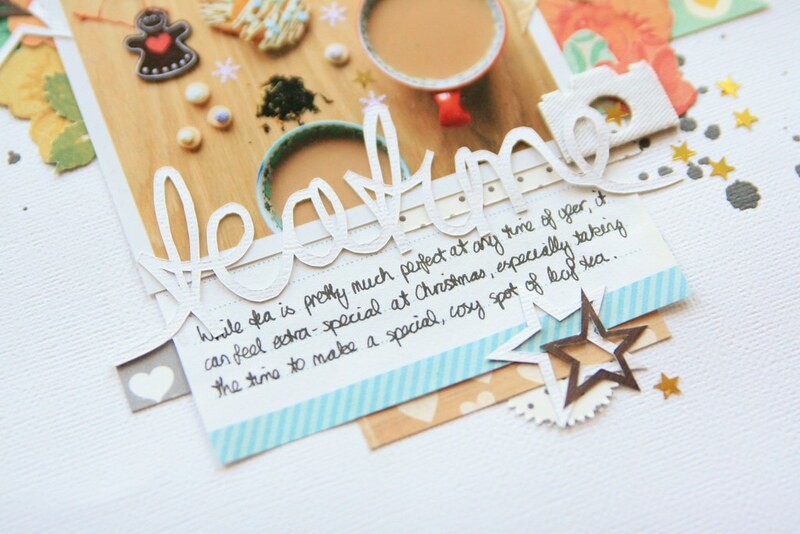 I like the festive colours which seem Christmassy to me without being overtly themed; in fact I don't think anything I've used to make this layout is actually part of a Christmas line. Layering the flowers behind the photo gave the page a more intricate, delicate look which I liked, but I still wanted to add something to great a bit more sparkle. To tie in with the festive subject matter, I decided to add stars to my page, and so I used a craft knife to cut out the outlines of five-pointed stars. I drew them free-hand before cutting them out in neutral patterned papers which would complement the colour scheme. 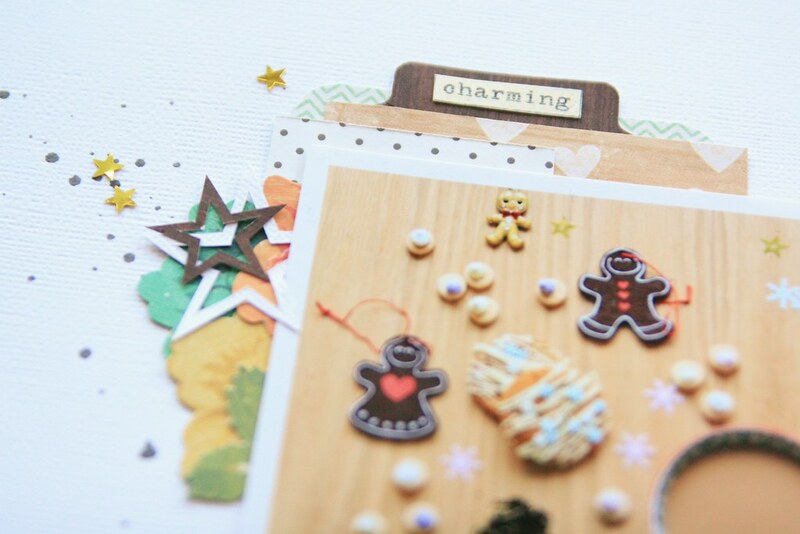 Drawing them out like this meant that each one was unique and slightly different in size and shape; an effect that I love as it adds variety and gives me the ultimate in personalised embellishments! I like the subtlety of a motif like this; it's easy to think of stars purely in terms of glamour and glitter, but a woodgrain star has an edge of sophistication. Hand wrote my title and cut it out with a craft knife. a technique that I have been a tad obsessed with of late, and set the title just below the photo to lead into the journaling. All that remained to finish the page was a little sprinkle of ink and stars. I often like to add a splash of black ink as it can help to ground the black of the journaling. And then a little gold star or two tops the whole design with a smidge of sparkle. I have LOVED pulling out photos from last year and scrapbooking those as and when I get the time. I don't have the hassle of printing or editing; the prints are ready to go and the journaling is written and recorded on my blog from last year. The only tiny downside is taking pictures of the finished pages when there are so few daylight hours. 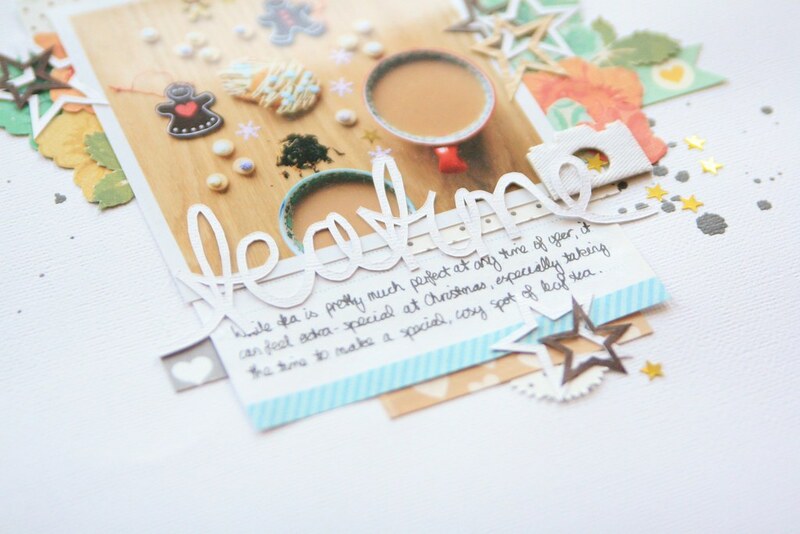 But mainly, there is just the pure fun of crafty Christmas time, when the weather outside is frightful but I'm cosy indoors with pretty paper. And a trusty cup of tea. P.S. 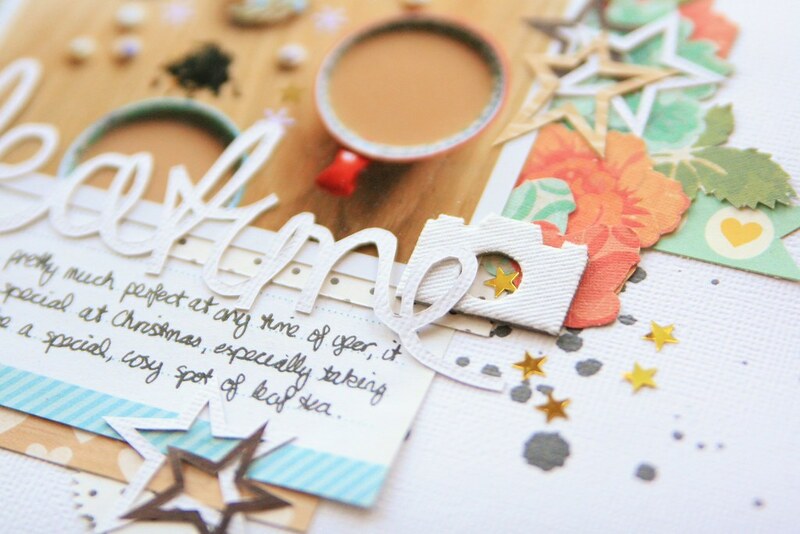 This post is one of my December series inspired by Shimelle’s scrapbooking class Journal Your Christmas. My aim is to blog every day throughout the month to document all the little moments that make the most wonderful time of the year. Merry Christmas!